Where did my Honor Scrolls go? Honor Scrolls have been replaced by Honor (no last name, just like Beyonce). Honor will expire at the end of each season and be converted to gold so it’s wise to spend it all before the next season begins! Will I still get Honor Scrolls for summoning friends? What about the Tower of PWNage? Will I still get Honor Scrolls from there? Since Honor is now more closely tied to PvP, a Quick Loot Key is now the reward for summoning a friend (or being summoned), and we’ve removed Honor Scrolls but increased the amount of PWNage Points players can gain in the Tower of PWNage. What will happen to the Honor Portal? In order to help everyone get used to the new PvP and Honor system, we’re keeping the Honor Portal exactly the same for now. Plans are in place to shake things up in the future, though. You will be able to spend your new Honor currency here just like you used to with Honor Scrolls. What will happen to any unused Honor Scrolls when the new PvP system starts? They’ll be automatically converted to gold, at an exchange rate of 250 gold per scroll. What happens to the current Pontifex token rewards for PvP tournaments? Pontifex Tokens will migrate over to the new Honor Shop for this first Pre-Season. His tokens will be available to players that ascend to certain leagues. And you can always find his tokens in the Honor Portal. Why does Honor expire at the end of each Season now? This is something that we've introduced to take advantage of the improved Honor Shop and to add a sense of immediacy in a given Season. This allows us to introduce various high-value items with each season that all players can aspire to earn in that Season. And of course, we'll be monitoring player feedback and making adjustments as we go. How many Leagues are there and how is my placement determined? There are 6 Leagues, comprised of 3 Tiers each for a total of 18 League Tiers. For the initial Pre-Season, players will be placed in the bottom 10 League Tiers based on level. Subsequent Seasons will use total Trophy count from the previous Season for League Tier placement purposes. What are the names of the Leagues and Their Tiers? What happened to all the Hammers I spent previously upgrading my chest? Unfortunately, you won’t be able to get those hammers back due to the way the new Hammer system works in regards to protecting chests. However, for those of you who may not have saved up a ton of hammers, we’ll be granting a one-time allotment to ensure that you have a healthy amount to safeguard your chest. I used to collect my chest once an hour for a decent amount of Gold… does collecting Daily get me a similar amount to what I used to collect over a day? This is entirely dependent on your League Tier…the higher the Tier, the more gold you will collect. For most players, this will be more than what they used to get, but again, it is dependent on your League Tier. Why is Gold and Honor fixed per Raid – it used to be based on my opponent? Gold and Honor are now fixed because the new PvP system matches you with players who are around your same skill level. As you progress through the League Tiers, your opponents become more challenging—and your Gold and Honor will go up accordingly per Tier. What happens to my trophies at the end of the Season? A percentage (about 80%, but subject to change) of your trophies will carry over into the next season to determine your League Tier placement. The amount of trophies that are able to transfer will also be capped between seasons. What’s the difference between a Pre-Season and a Season? Because this is an entirely new PvP system we wanted to make sure that players had a chance to try it out and give us their feedback. For this reason, these first few Seasons are actually Pre-Seasons. Expect some fine-tuning before the official launch of Seasons. You can give us your feedback here on the forums. Will my raid tickets carry over? Do Defensive Losses Stop Your Win Streak? - The Shop: Gold, Gems, Specials, Events, Awards. You can spend real money, gems, and when active, event tokens. - Honor Shop: Honor. You can spend honor scrolls here. - Aether Shop: Items, Silver, Gold, Exclusive. You spend aether here. - Pwn Shop: Pwn. You spend pwnage points (silver cups) here. - The Portal: Great Summons for gold, Heroic Summon for gems, Honor Summon for scrolls, and VIP Summons. I don't know yet how will be the new setup, but as an over-a-year-and-a-half player I still find confusing so many shops! Other similar games have just one shop, of course with various sub-shops, where you can spend all your goodies from the same place. I will wait to see how the new pvp changes work. But there is NO reason to use friends if I get quick keys I do not want to level fast and I am ways maxed out. I rarely use them. I throw keys out daily. what will happen to Ella tokens? @Joveth Pvp changes are looking great! I suggest adding a new daily quest for using friend heroes that rewards 4 raid tickets. I think a lot of the changes seem promising, but loot keys seem like a really lackluster friend reward. I am also always maxed out unless a 3x resource rewards event is running. Similar to hammers and excess XP potions, loot keys are not a resource I am ever excited to get. At least in the current honor scroll system you could potentially convert them to tokens, evos, gems, etc. in the honor summons. Also, I think the very top 100 pvp players are always going to be the same whales that currently dominate the pvp ladders. By sheer volume of raids they complete, most players can not even compete. I hope the rewards are significant enough at the other levels to make pvp worthwhile for the rest of us! At this moment you can get screwed over by such people no matter what level you are, with the new system they will take place in the higher tiers over time and get out of your way. This will probably also get rid of bait teams, as they form an easy win for good players and give the same rewards as a better 4-man team. The reason bait teams won more than they lost was that they didn't give enough trophies (mostly just 4 trophies) for good players to pummel them. I also hope this phuks the slow levelers, because they are not good for this game! It does. Slow leveling is obsolete and actually an impediment after this update. My only comment is that quick loot key storage needs to be increased so we are not constantly bumping up against the limit. How exactly does it mess up slow leveling? How would it be an impediment? Slow leveling means you spend your player XP wisely and get as much power as you can for it. Thus for your level, you will be stronger than someone playing less cautiously. You will still get matched up with those of your same level more or less right? So slow levelers ought to do better. Am I missing something? The main problem I see is that there doesnt seem to be an "Easy, Medium Hard" anymore. So if doing a bounty hunter quest or needing to win with 2 goblins for example, I want easier matchups. In fact, the more I progress, the harder my matches will get which will be counterproductive. I get a bit more gold honor for it, but I start losing more matchups and lose the ability to easily complete Color-based daily quests, goblin type quests as per above, etc. Good question, but it seems like leagues are trophy based (other than the first pre season), so the lowest level league could still have level 70 players in it from what I'm reading. I think this is potentially an issue that might arise if you get a bunch of inactive level 70's in the lower leagues. Lower level players might have to refresh to find matches that are close to their level. @Joveth - any thoughts on how this won't be an issue mixing all level players in the same league? Edit: After re-reading the original announcement below, it looks like that while level 70 players can be in lower leagues, it appears the matchmaking will still match you against similar level players, so it looks like except for the top 3 leagues, low level players can still be competitive with higher level players in the same league. This does open up some other potential issues, however. 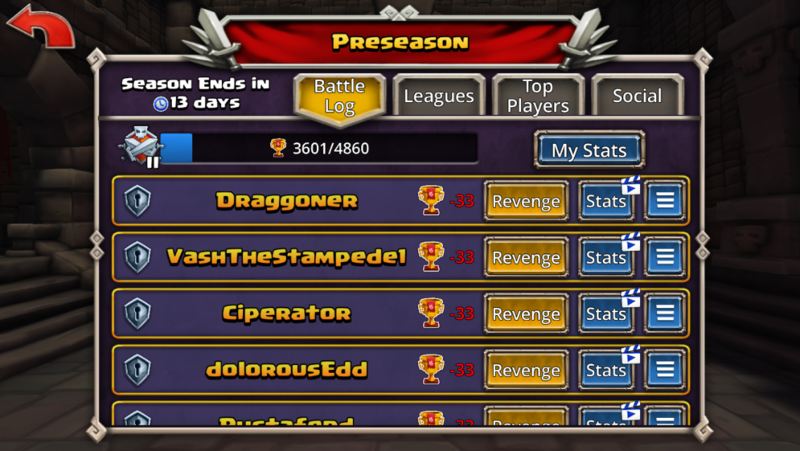 If a really low level player makes it into a high league (#4 for example), unless a lot of similar level players are also there, it might be difficult to find a match. Same thing for level 70's in the lowest leagues -- might not be enough players to fight against close to your level. Increased daily reward Gold and Honor payout. Increased Gold and Honor rewards for Wins. 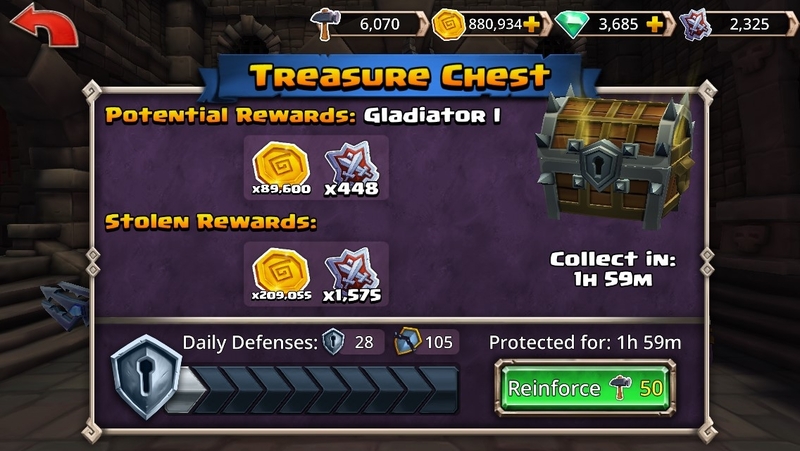 Increased amount of Gold and Honor pillaged from defeated players. Beware that the top three Leagues (nine League tiers) do not have matchmaking restrictions – it’s a free for all!" I don't get the hate for slow/smart leveling. the only way I can be competitive is to slow down and be smart, without spending hundreds of dollars, and I am not going to spend hundreds of Dollars. I spend enough to get to VIP 3, what I feel is a decent amount for a video game. So since I am not spending more I need to figure out how to compete with the folks at my level or even lower that have their heroic portal heroes 5-6 stared with full on runes? We either spend time (slowing down) or money? Why the hate? I had hopes that this update would add variety and fun to PVP, but it seems it will just change up the rewards and add and the league structure? Not the actual game play where you see the same heroes over and over with the same basic rune set up. The way to winning is with quantity not quality. fyi - you can edit your original post to correct typos. I'm constantly doing this as I make lots of mistakes. fyi - you can edit your original post to correct typos. I'm contantly doig this as I make lots of mistaks. What happens to uncollected honor scrolls in your mailbox after the update? The universe collapses if you claim them. No hate. I'm just telling you that since your PVP raids will now be determined based on your standing rather than your level, slow leveling is effectively dead. You'll still be OP for your tower, but will no longer be able to wipe your opponents in PVP simply because you have spent more time and progressed less. Instead you'll disadvantaged as you're going up against people many levels above you and will be missing more often and likely have a smaller health pool than those who are well above you. That is just for the top 3 leagues (9 tiers). The lower 3 leagues you should still be fine at lower levels since they do level related matchmaking. Honor Scrolls have been replaced by Honor (no last name, just like Beyonce). Isn't her last name Knowles? Maybe use Sinbad or Madonna? Does your streak reset to 0 if you don't log into the game enough? I had a small win streak 1-2 hours ago and left to go do something else. I come back and now my streak shows 0. I did not refresh with gold since I can't even do that with 0 raid tickets. Furthermore, I looked at my log and it shows several wins and no attacking losses. You have 1 hour after your win to keep the streak going, once you win again it resets the timer to give you another hour to keep the streak alive. I see, thank you @Gunnen. How are rank requirements determined? They each require a certain amount of trophies to enter that rank, but how is that amount determined? Is it dynamic or static? Will the different ranks always require the same amount of trophies to enter or will it change based on some quantifiable measure, like performance from the entire player base? Is there a limited number of spots in each rank? Because Seasons plays differently than previous PvP - we had to make some assumptions for the Pre Season - part of the ongoing balance will be to look at actual data of win percentages (across league tiers / player level / etc. ), defenses, defense win percentage, etc. Ok, thanks for the response. You wouldn't be able to say at this point whether we might see a drastic increase in rank requirements going forward? Drastic to me would be tuning it over about %25 of their current values. It's not a "hard" limit because if you're already served as an potential opponent to a range of people - we don't yank it out from underneath them. If you're actively raiding other players, you are still vulnerable to attacks frequently. These changes will be active in the next update (not a specific eta but as soon as is possible). We will continue to tune this number (the limit is based on your current league) over the course of this first season. We can't make a commitment yet on constraints of that tuning - a lot is based on getting a few more days of actual play data with a large population set around number of raids attempted, win rates for both attacks and defense, win streaks, and similar. Looking at this data in averages and distributions across player level ranges, League tiers, and play times. It could (or could not) be a situation where 25% over current values make sense based on trends. I will say this - we do want players to spend a decent portion of a Season around their achievable League tier so that they can take advantage of appropriate daily rewards.